Remember that headboard we ordered? Well, it arrived safely yesterday. 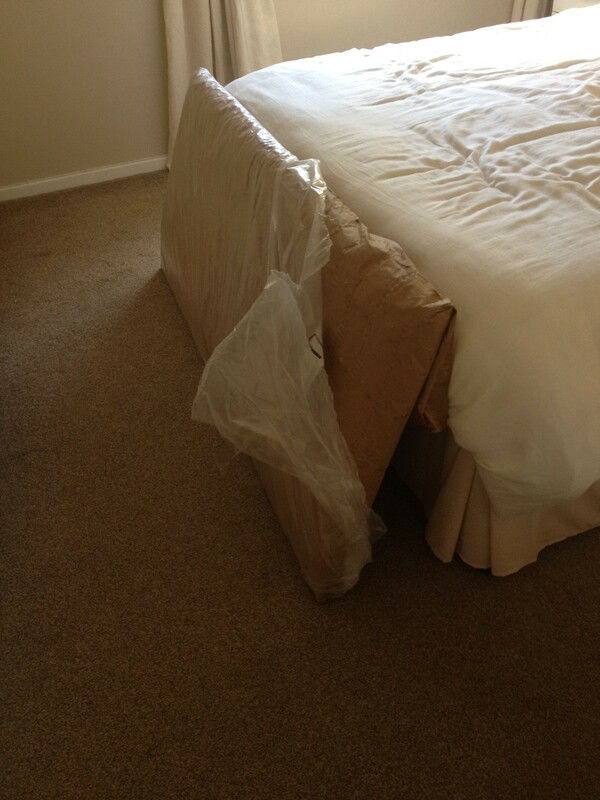 I was impressed at how well it was packaged up, considering we had bought it so cheap! I arrived home with the 5ft king size headboard, courtesy of a taxi ride via 1 AB. 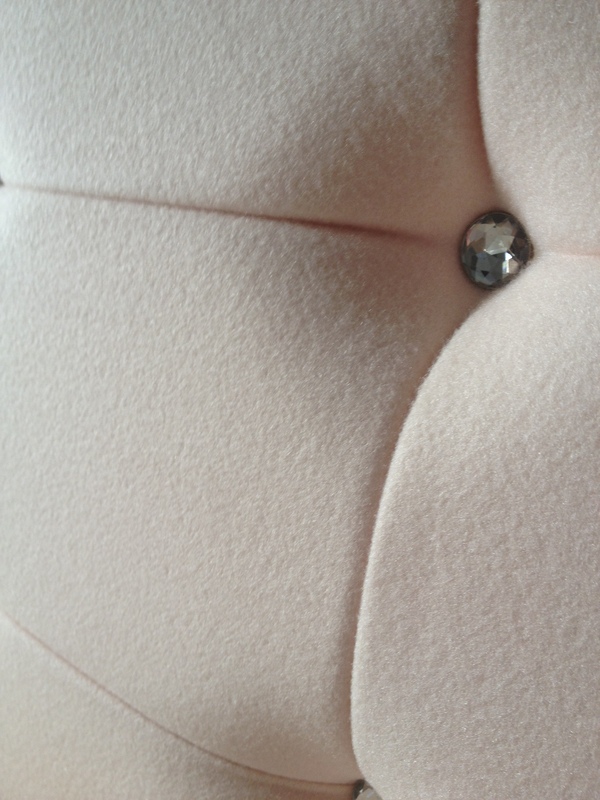 I was dead excited for unravelling our new crystal studded diamante headboard! When I removed the headboard from its packaging I was quite concerned that the colour was not ivory (as stated via eBay). I thought, hmmm maybe it will actually go once it’s fixed to the bed and once the bed is made! I flipped the headboard over and screwed the struts to the back via the pre-marked holes. The headboard was extremely easy to fix to the bed, and it’s always an added bonus when something brand new arrives from delivery with all its parts – wouldn’t you guys agree?! Anyways, the headboard was fixed to our 5ft bed with ease and when I stood back my initial thoughts were, ‘Kelly is not going to like this!’ I decided to break the news to her gently, via a text message – as you do when you want to avoid someone the impact of disappointment. When Kelly arrived home, she took one look at the headboard and said, “That’s not faux suede, it’s not even faux velvet – what is it! ?” I could tell she was not one bit impressed by our purchase. The colour was definitely not ivory, which is what we selected during the purchase process. 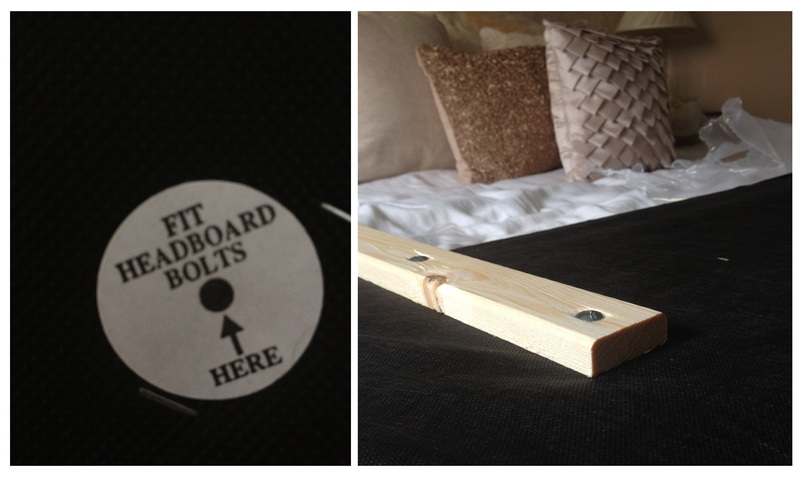 On a plus side though, the headboard was cheap and had all its parts to assemble and affix it to our 5ft bed. 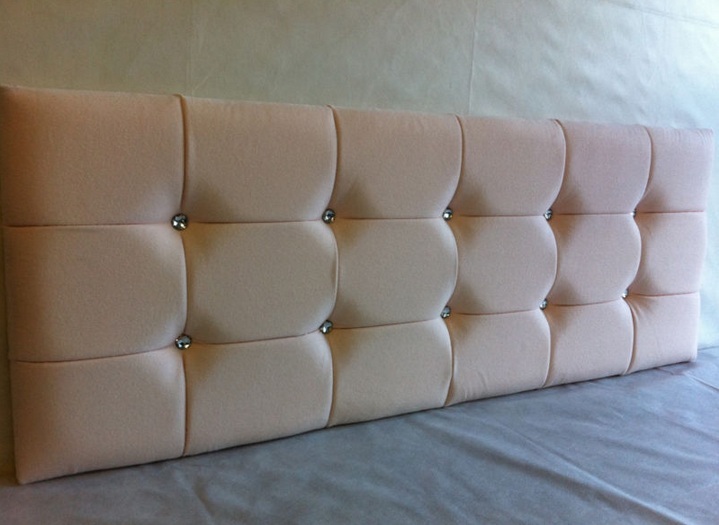 The headboard would actually be a real nice focal point in a bedroom with its studded crystal diamante design, and cream/ peachy appearance. Unfortunately the colour doesn’t go with our wallpaper and to be honest, we admittedly did not do very well with this purchase, however it is just going to have to do the job until we get back from our holiday – then it’s back to the drawing board… or headboard! We definitely didn’t do well with this purchase guys, it looks ‘horrendous!’ I did consider re-papering the wall, but that would mean needing new lamp shades to match the ‘so called ivory finish’ of the headboard, and also a new light shade – the headboard just has to go. I’m thinking of a plain ivory leather finish this time – I will keep you guys posted of my progress. Home Accessories … and a hamster! 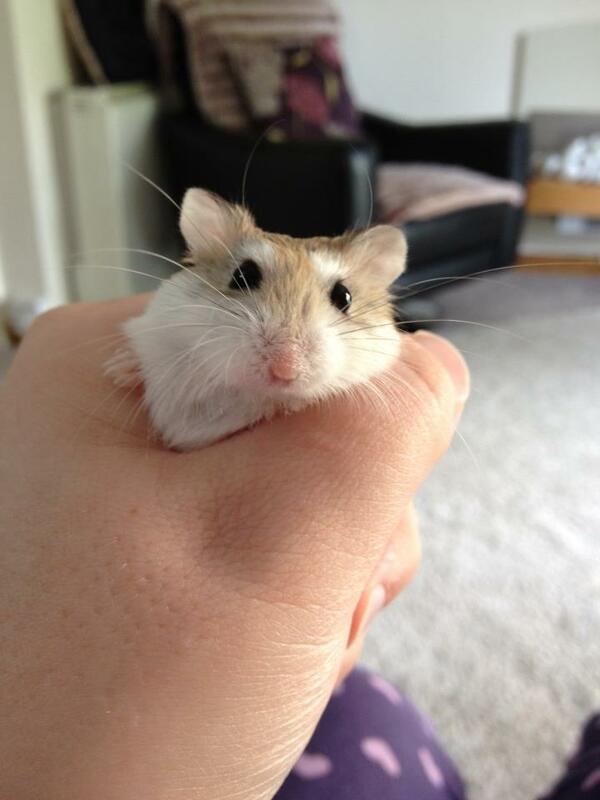 Other than the new washing machine we purchased on Saturday, Kelly and I purchased a new addition to the family – ‘Rolo’ a Roborovski Hamster (we adopted him from Pets at Home, after we bought the washing machine from Curry’s – as you do!). Unfortunately when we returned home with Rolo with his brand new cage and his home accessories, we discovered that the sucky stick on pads which hold his water bottle on we’re missing. As a result of this we had to go back to the other side of town. Kelly decided to go and purchase that much needed new wash basket, from Argos. Kelly decided on a Seagrass finish wash basket, as this would match our bedroom decor, and wouldn’t look out of place stood on our carpet. 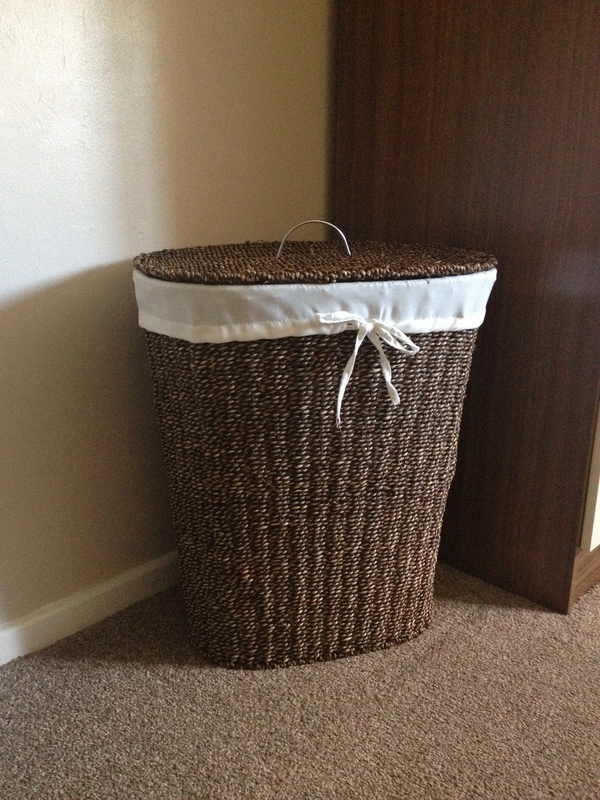 I was impressed with Kelly’s choice of wash basket, with it’s woven design and linen lining. 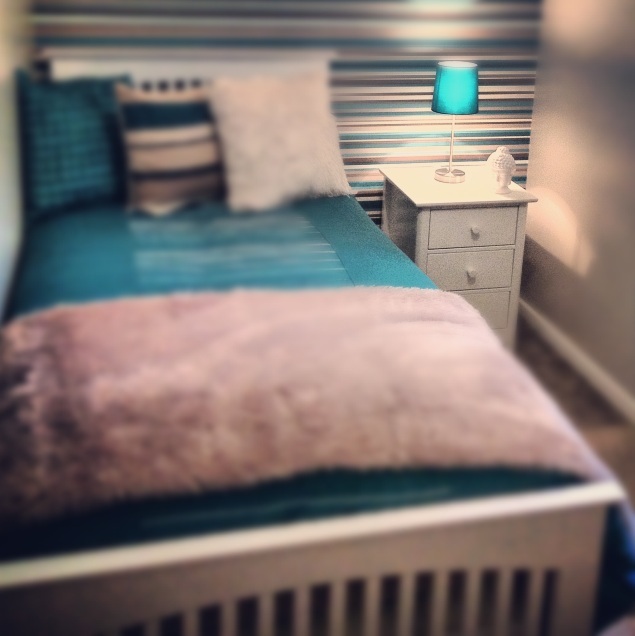 I think it looks gorgeous and it finishes the bedroom off a treat! What do you think? And here’s a picture of Rolo – he’s sooo cute! DO NOT leave the washer unattended! Saturday was a bizarre experience! I had been rushing around with Kelly in the hope of buying a new wash basket for our bedroom. I love purchasing new things for our home, and a linen basket was a top priority. We had already been down town for an eye test, and we had forgotten to buy a wash basket and had to come home as Ruebec (Kelly’s mam’s dog) was staying over. I felt it unfair to leave him for any lengthy time. When we arrived home, we awaited Kelly’s mam returning from her short break. Ruebec was extremely excited, as we had told him his mum would be coming for him soon – god love him! Anyways to pass the time, Kelly and I began cleaning the full flat. We both have OCD, so as you can imagine this was a lengthy task. Kelly had put the washer on, and at this point it was almost on its final spin. I was in the bathroom with a cloth in one hand and bleach in the other. All of a sudden I heard a crash/ clattering sound, and I noticed our two cats scarper out from the kitchen. Kelly investigated and shouted, ‘MAM, the washer is on fire!’. Of course, her mam wasn’t in the flat – she meant to shout for me but was in so much shock and fear that she shouted for her mum (bless her). I dropped my cloth and bleach and ran in to the kitchen. The noise was horrendous! There was sparks inside the drum, and the Hotpoint washer machine had moved significantly out from the wall due to all the vibration. I was shocked and thought, ‘this thing is gonna burst into flames!’. I had no alternative but to switch the washer off at the wall – which luckily solved the problem! We had to go out and buy a brand new washer, with delivery for Sunday – as the washer was out of warranty and we weren’t willing to be without a washing machine all weekend, plus neither of us could take time off work to await delivery through the week. We browsed Currys and Comet for their deals. In the end we took another trip across town and looked in store. We opted for this black 7kg washing machine. Although it isn’t Hotpoint like our old one, which actually lasted us years and served us well, it was a brand new washing machine which came with a manufacturers warranty. It was also well within our budget, and we both agreed it was the better buy out of any on the shop floor. Kelly and I were both shook up by the ordeal. Imagine if we’d popped to our local shop? This incident could of been far worse! Has anything like this ever happened to you or anyone you know? We’re they as lucky as us?! Tindale Towers: North East Mansion! Living in Darlington there’s only a handful of luxurious houses around. 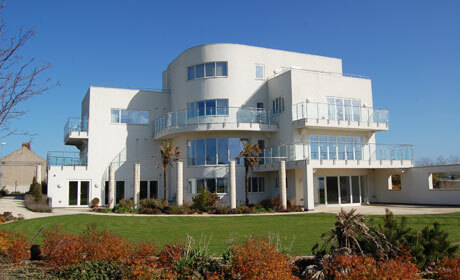 This mansion is certainly famous in our local area for its Hollywood glamour, and location. Built on once a drab North landscape, this house was designed around the inspiration of beach houses which owners Mike and Jules (owners of Keen Replicas) saw in Florida and the South of France. Tindale Towers has appeared on I Own Britain’s Best Home, as well as being the star of the Royal Institution of Chartered Surveyors annual Renaissance Awards at the Civic Centre, Newcastle. Personally, I love this family home. The fact that this huge house is located between a bypass and a scrap yard would not deter me from living inside it – this place is awesome! This home boasts originality and exceptional design, no wonder its on sale for £3m. Recently Kelly and I have been looking around for a new TV for Jess’s room (our guest room). Unfortunately this kind of side tracked me in to looking at Televisions for our living room. I have always been one with expensive taste, so much so that this Bang & Olufsen BeoPlay V1 TV, I just had to add it to my ‘Things I Need Friday’ list! If I had this modern TV I would most definitely be anchoring it from the ceiling using anchors and wires – it looks AWESOME! The BeoPlay V1 was created by designer Anders Hermansen, and what a great design it is! Features of the BeoPlay V1 include a powder coated steel cabinet which creates an industrial feel to the aesthetics. The BeoPlay V1 television has the ultimate in audio prowess, the stereo sound which comes out of BeoPlay V1 out-performs other conventional television speakers. 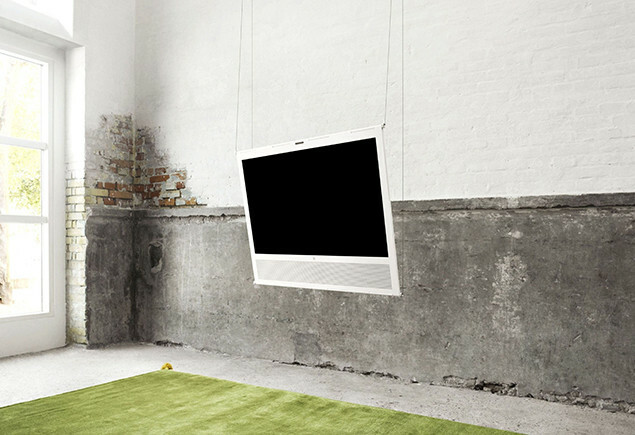 Available in 32” or 40 inch, aw well as black or white finish, the BeoPlay V1 television is breath taking! This desirable TV is modern, luxurious and certain to add an impact to any living space. 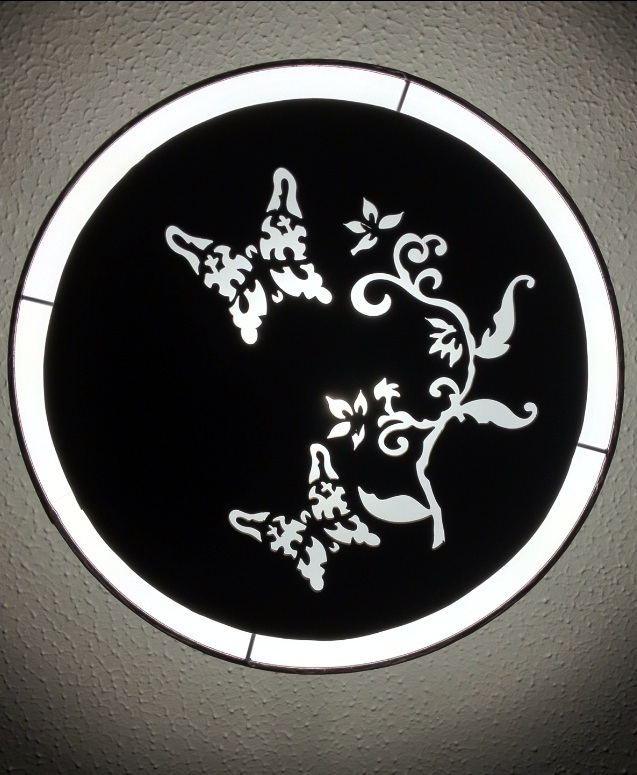 Kelly and I recently purchased a gorgeous light shade. 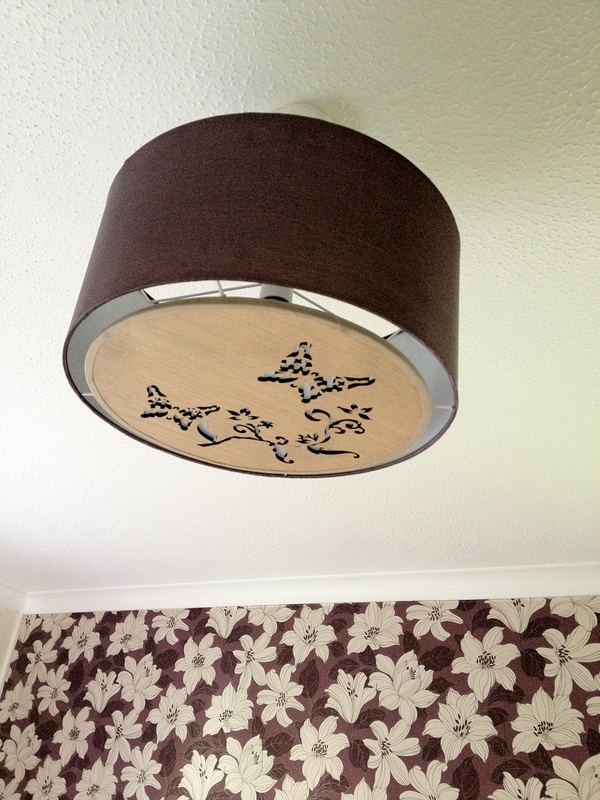 We had been looking on other blogs, like this one, for inspiration – unfortunately we didn’t have any spare time to create our own desirable light shade this time! luckily for us, we were in TK Maxx and Kelly spotted a light shade which was the exact same shade of purple as our living room feature wall. I loved it as soon as I seen it, not only because it was an exact colour match but mainly because it featured a wooden circular base which had carved floral design with butterflies. The wooden aspect of the light shade ties in with our wooden floating fireplace and wood finish skirting boards. We just had to buy it – I insisted! On a night time, the butterfly inserts create a glowing look – which I absolutely love! NEWS FLASH: London 2012 Olympics furniture is up for sale! How amazing! Before most of the 17,000 Olympic athletes and officials had even slept in the beds, let alone sat on the chairs, or switched on the bedside lamps, they were set to go on sale at auction. The sale consists of 11,000 beds from the athlete’s rooms, thousands of chairs from the main dining hall and everything from clothes drying racks to cushions and extension leads are also up for sale. The guest pass and ticketing centre reception furniture is the most expensive furniture items being sold at a cost of £2,500, while the cheapest items are 50p coat-hangers which will be sold in batches of 10. Other items up for grabs include 14,872 LED bedside lamps for sale, 6,326 cushions, 7,496 clothes drying racks and 17,978 folding chairs – costing £8 each. Whoops, I almost forgot; amongst other items for sale are 1,000 £99 athletes’ bedroom sets which comprise of a bed, mattress, lockable bedside table and a lamp. Last but not least, brightly coloured £15 bean bags are up for sale too. Ramler Furniture, the Organisers of the sale, which has the contract for sourcing more than 1m products for the Olympic Village and assembling the flat pack furniture, have created a dedicated website to handle the sale. Visit the sale and get your piece of the Olympics 2012 furniture. Apparently the company bought back items from Locog as part of their contract and has already begun selling them to the public and trade buyers. All items are available for collection or delivery after the Paralympics closing ceremony. Hey guys, well it’s been a while since our Birlea furniture arrived. Remember that teal and white guest room? Well, we’ve had Jess stay around (Jess is our friends 6yr old daughter) and Jess has been telling us what she does and doesn’t like about the furniture. Firstly, she loves the 3ft Toronto guest bed, which we purchased from Bed SOS. She says the mattress (also from Bed SOS) is very comfy – it’s like a ‘bouncy castle’ according to Jess. Jess loves the Cotswold three drawer bedside cabinet. She loves the fact she has her own clothes in there, which in her eyes makes it ‘hers’ (basically – because she’s been staying over frequently – Kelly and I have told her its her bedroom!). She manages to open the drawers with ease, and doesn’t struggle to close them. The drawers are not on metal runners, the whole of the drawers are constructed from solid wood and the drawers sit/ slide on a wooden piece. Jess doesn’t like the fact that her Lego box doesn’t fit next to the bed anymore (due to the Cotswold bedside cabinet being there instead). With regards to the Birlea Cotswold 4+2 drawer chest, at first Jess complained that it was too high! We explained that the only reason the chest of drawers seemed too high was because she was laid in the bed looking at them. Once she stood next to the drawers she realised that they were a perfect size. Jess now loves the drawers, and has her books and Bratz doll safe in the very bottom drawer. 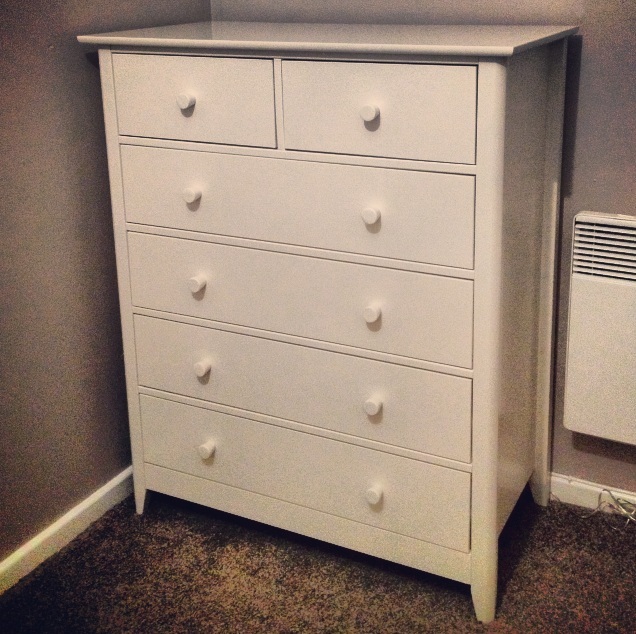 Again, the Cotswold chest of drawers is constructed in the same way as the bedside cabinet. Jess manages to open the drawers easily, and also closes them without struggle. Jess loves the two small drawers located at the very top, Jess claims that these are ‘cute!’. Jess doesn’t like the fact that her Cotswold white chest of drawers does not have an LCD TV sat on it – so at present she can’t watch TV in bed! We’ve promised Jess that a brand new television will be purchased in the very near future to accommodate her room. Top Tips: Choosing the right bed! The style of a bed is important. It’s no good putting a state of the art TV bed in a bedroom if the décor is more suited to a traditional bed frame – it would look like an alien had landed. Faux leather or real leather beds are perfect for modern bedrooms, whereas metal beds are perfect for contemporary bedroom décor. Wooden beds a perfect choice for a child’s room, or for any guest room – whereas luxurious ornate wooden beds are ideal for any Shabby chic bedroom. Depending on if the bed you are choosing is for a guest room or a main bedroom depends on which material would be most suited. Price wise, it would be crazy to put an expensive genuine leather bed in a child’s bedroom. Although real leather beds are durable, they are still easy to scratch or tear – therefore a child who likes to climb around on their bed is probably more likely to tear, scuff or scratch a leather or faux leather bed. 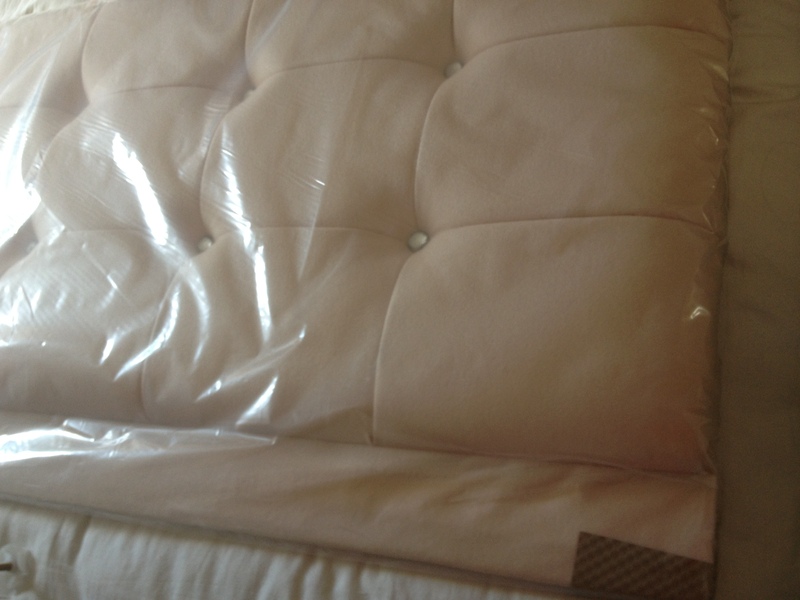 Faux leather beds are a cheaper alternative to genuine leather beds. Although faux leather beds don’t have that real leather smell to them, they have the exact same appearance and are just as hard wearing. Divan beds are usually available in a wide range of material options. Recently we purchased our very own first divan bed, and we were able to upgrade the material to a thicker, more durable material. Bearing in mind we have a kitten, leather and faux leather beds were not a wise option in our case. Metal beds are usually very reasonable in price. Some high end metal beds are great for a main bedroom, these are usually made constructed from brass or nickel, and feature very attractive ornate designs. Children’s metal beds are usually quite cheap and often come in child-like designs, such as football themed or princess themed beds. Metal beds are possibly the cheapest option available for any bedroom. Metal beds are hard wearing, but not as hard wearing as wooden beds – as metal beds can sometimes have give and thin hollow tubing which can become bent if mistreated. Wooden Beds are the most durable of beds. Wooden beds are available in a variety of wood materials, such as solid oak, hardwood and pine etc. 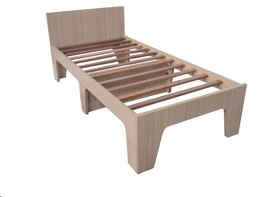 Wooden beds are usually available in a small range of colours, which include pine, oak or white finish. Natural wooden beds are usually finished in a wax finish. Wooden beds are a great choice for children’s bedrooms, as they are the most durable of all beds. Most children’s bunk beds are constructed from wood, as wood is tough and not easily bendable (other than the slats if ‘jumped’ on). Solid wooden beds can be fairly expensive, but they are worth every penny. Some wooden beds are available with carved detailing, perfect for any traditional bedrooms. White wooden beds are usually found in guest rooms, as they look clean and modern. Many beds are designed to be functional, ie they have storage underneath or the added bonus of a spare bed underneath, or even a desk area underneath. Nowadays you can even buy a bed which houses your flat screen TV. Price factor can be the determining factor of which bed you choose. We suggest shopping around for the latest deals. Most good bedroom furniture retailers have an all year sale on, offering you great savings all year round. Bed SOS is just one example of a competitive bedroom furniture retailer, devoted to offering you the best possible savings. Don’t just settle for the cheapest of cheap when it comes to purchasing your bed. Evaluate what material the bed is constructed from, and summarise what the best possible buy is available to you. Using the above tips may help you choose the right bed for your home.